Finding the right pair of glasses can be difficult. Most individuals will have to wear glasses for extended periods of time, so finding a pair that fit comfortably and make you look good is essential. Uncomfortable glasses can lead to an inability to perform at optimal functionality as you will be in a state of discomfort, as well as possibly impaired visually. This article will offer suggestions for women with small faces in regards to glasses selection. 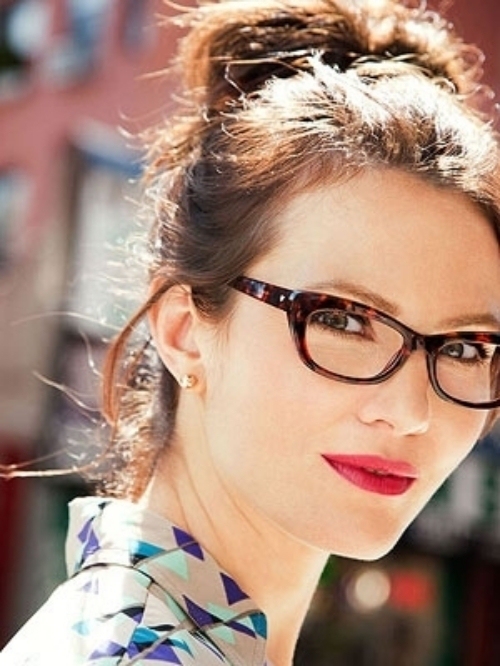 Look for glasses with frames measuring within the region of 42-45mm. Look for glasses that have thick arms, and tall wider frames. This will help to balance your facial features whilst simultaneously ensuring that you can see without hindrance. Glasses for small faces can come in many shapes and styles, if you want your face to appear wider, then acquire glasses with some form of decorative element on the temple area. This will help to draw attention to this part of your face, making it seem broader. Avoid thin glasses, these will only make your face appear smaller and more narrow. You should, however, not get glasses that are too big for your face. There are many things to consider when purchasing a pair of glasses to ensure that you find a pair that fit you perfectly. One of the main considerations to take into account is the shape of your face. Generally speaking, there are five categories of shapes that most people's faces fall into. These are: oval, square, round, oblong and heart. When selecting glasses, it is important to find a pair that are shaped accordingly to the shape of your face. Finding glasses for small faces isn't always easy, and an important thing to remember is that very few people are identical. This means that not everyone will fall within one of the categories stated above. Don't worry if you can't define your face by these set categories as these are only general guidelines. It would be wise to verse yourself in the measurements of glasses so you can understand exactly what you are looking for. Understanding lens and bridge size, as well as temple length and frame width, and how they correspond to the measurements of your own face, will help dramatically when you are trying to find the perfect glasses. Another point to consider when purchasing glasses is to try and coordinate the pair you buy with your own best features. For example, if you have piercing blue eyes, then acquiring glasses with a tint of blue will help to accentuate your best features. If you have a particular color you like wearing in regards to clothing, then get glasses that you know will match. This will help to ensure that the glasses do not look out of place, rather, they work to improve your appearance. When looking for glasses for small faces, remember that with so many options to choose from, you are sure to find a pair that fit you perfectly, whilst helping to widen the appearance of your naturally narrow face as well as revitalize your fashion and style. Never be afraid to seek the advice of an optician who will likely be able to help guide you in the right direction.